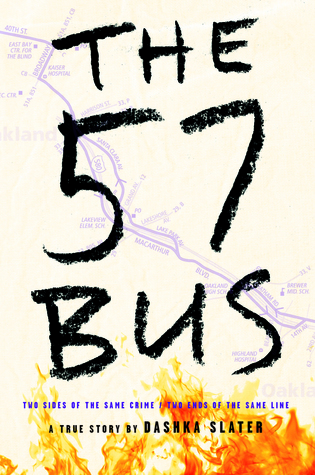 “The 57 Bus: A True Story of Two Teenagers and the Crime that Changed Their Lives” (Farrar Straus Giroux 2017) is nonfiction brilliantly pieced together by journalist, Dashka Slater. Using interviews, letters, videos, diaries, social media posts, and public records, she tells the story of the victim, Sasha, who is white, affluent, brainy, agender—that is, doesn’t identify as any gender—and attends a private high school. When the reader gets the whole story, derived from bystanders and friends on the 57 bus, it looks more like one teen impressing his cohorts—not necessarily “hate.” After all, Richard had sought out help from a counselor at school to pull himself out of a spiral that takes so many black youth into a life of crime. He’s a nice kid. He has a mother who might be overwrought but she cares deeply. The gender and sexuality glossary starting on page 33 is enlightening. Agender Sasha has asked to be described as “they” or “them.” The author, in solidarity, complies. She says you get used to it. Thank heavens “they” was used only in Sasha’s short chapters, because I had a hard time translating the plural to the singular. Some gender fluid people prefer the new pronoun, “ze” or “xe,” which I wish would catch on. She says juvenile justice studies find “that around the world antisocial behavior increases by a factor of ten during adolescence and then begins to taper off as people reach their early twenties.” Not just in America, not just one the California Bay Area, where this story takes place, but “around the world.” This is the nature of adolescence. We get to know the families of both Sasha and Richard. They go through waves of emotions, but both sets of parents are good. They’re trying. This highly-researched well-written cautionary tale invites empathy, provokes discussion, and ultimately gives one faith in humanity.